This post isn't something that's an easy thing to talk about. Miscarriage or stillborn deaths are all in the same package- the pain and death of your child is gut wrenching, heartbreaking and one that takes so much time to process. Regardless of how long your child was here on earth or in your womb, it's still the loss of your little one. Throughout the last few months with my second, I have had several close friends, family members and even blogging buddies go through this and I was at a loss for words on how to help them through such a difficult time in their life. I've never gone through something like that before and was unsure how I could be of service to them, their family and loved ones. If you have a friend or loved one going through something like this, here are some ways you can help. 1. Listen - Of course there is no way to know exactly when a parent will need or want you as she goes through her grief. There will be times she'll want to talk about it all or she may just want to just sit and cry. Perhaps she may even find comfort in hearing your own story of loss if you have been in her shoes or she may just want you to sit and listen to her. Just follow her lead as she'll set the pace of the conversation. Let her know that you are available for whatever she and her significant other needs. 2. Be There - When I first found out a best friend of mine had lost her child, I felt awkward. I didn't know what to say to comfort her or help her. I wrote her a long note and sent flowers. I hugged her. I prayed with her. I was just there for her whenever she needed me. Be there for your friend. Even she doesn't respond right away, she will and that's when you can be her support. 3. Be Mindful - Going through friend's having miscarriages while I'm feeling kicks and turns of my own was extremely hard. I felt like I didn't want to share my happiness (and one of the reasons' why I haven't put too many "Bump Updates" on the blog because I honestly felt guilty of sharing it. This might sound silly but I'm extremely mindful of those friends who are loyal readers of my blog and knew it would be even more hurting to see how wonderful my pregnancy was going and their's was over. I know it will take time and that's ok, for them to smile and be around me again. For now, be there for them and be mindful of them not wanting to be around babies or pregnant woman for a bit. 4. Mark Your Calendar- Their baby should never be forgotten and so I've marked my calendar with the dates of when they were supposed to be due and when they received their awful news to know that when that day comes every year, I'll be there to help them through it. Several of my friends appreciate the comfort of you remembering their baby and keeping their memory alive, regardless of the outcome. 5. Allow Them To Grieve - Don't tell them how they should feel because only they can barely express that emotion. Tell them that it's ok to feel grief, sadness and numbness due to the shock of loosing their baby. However they are feeling, it's how their supposed to feel. There's no wrong or right way to feel but just to feel in that moment. You'll feel joy and sadness all at the same time as the weeks continue and that's perfectly fine. Of course these are just some ways to help a friend and I'm sure you can all think of many more. If you have gone through something like this, I'm sharing a huge hug and glass of wine with you. Never feel as if you are alone in the process and healing. Reach out to your friends and family when you are ready. We're all here to support you. 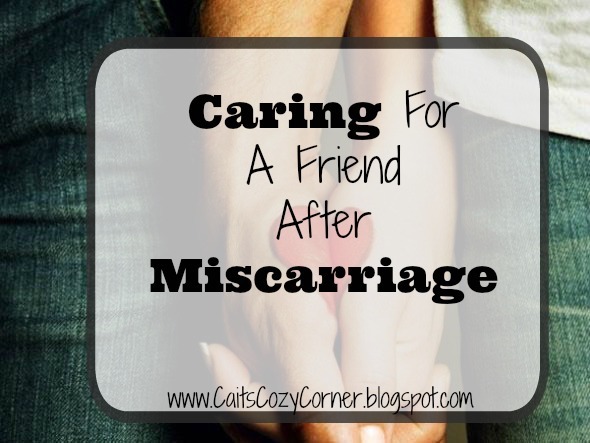 Have you or anyone you known gone through a miscarriage? How have friends helped you along the way? Great tips on such a hard topic! Been there myself and love these tips. especially that you are thoughtful enough to mark dates on your calendar. My sweet friends did something for me on my due date and I was really touched. Great post! !